Great Britain have achieved their best ever European Championships result with five boxers reaching their respective finals in Bulgaria. Harvey Horn, Pat McCormack and Qais Ashfaq led the way with a 100% return in the afternoon session. Muhammad Ali and Welshman Joe Cordina continued the impressive return when the action resumed. Light-heavyweight Joshua Buatsi could not complete the clean sweep as he lost to the Netherlands's Peter Mullenburg. Nevertheless, from a seven-strong team, Britain will have six medallists, with five still in with a chance of gold from Saturday's finals. Ashfaq booked a bantamweight final with Michael Conlan when he accounted for Aram Avagyan of Armenia. 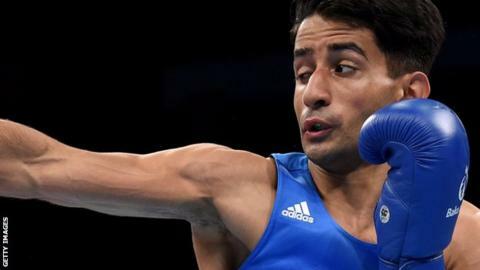 The meeting represents an opportunity for Ashfaq to avenge his defeat by the Northern Irishman in the final of the Commonwealth Games in Glasgow last year. "I have already faced two fighters who have beaten me in the past, and beaten them," he said. "It's the same with Conlan. He beat me in the Commonwealth Games final. Now it's my time." Britain's previous best showing in the 90-year history of the European Championships was five medals in 2010, three silvers and two bronze.